The Blue Nile is a river originating in natural springs above Lake Tana in Ethiopia. The river has played a significant role in human history by supplying the majority of the water for the Nile River, providing the means for the land through which it flowed to be agriculturally productive. Having the Nile's floodwaters to depend on gave rise to stable early human settlements and the ancient Egyptian civilization. Today, dams along the Blue Nile in Sudan produce 80 percent of that country's electric power. The Sudanese dams also help irrigate the Gezira Plain, which produces cotton, wheat, and other crops. The Blue Nile is also tapped to supply significant amounts of electric power not only for Ethiopia, the primary nation through which it flows, but also neighboring Kenya, Djibouti, and Sudan. The Abbai portion of the Blue Nile rises at Lake Tana and flows for 19 miles (30 km) before plunging over the Tis Issat Falls. The river then loops across northwest Ethiopia through a series of deep valleys and canyons into Sudan. There it is known only as the Blue Nile. The annual flood in Egypt is a gift of the annual monsoon in Ethiopia. In the winter, when little rain falls in the highlands, the Blue Nile/Atbara rivers dry up. In the summer, moist winds from the Indian Ocean cool as they climb up the Ethiopian highlands, bringing torrential rains that fill the dry washes and canyons with rushing water that ultimately joins the Blue Nile or the Atbara. Although there are several feeder streams that flow into Lake Tana, the sacred source of the river is generally considered to be a small spring at Gish Abbai at an altitude of approximately 5,905 feet (1,800 m). The Blue Nile much later joins the White Nile at Khartoum, Sudan, and, as the Nile, flows through Egypt to the Mediterranean Sea at Alexandria. The Blue Nile is so-called because during flood times the water current is so high that it changes color to almost black; in the local Sudanese language the word for black is also used for blue. The distance from its source to its confluence is variously reported as 907 and 1,000 miles (1,460 and 1,600 km). The uncertainty over its length partially results from the fact that it flows through virtually impenetrable gorges cut in the Ethiopian highlands to a depth of some 4,950 feet (1,500 m)—a depth comparable to that of the Grand Canyon in the United States. 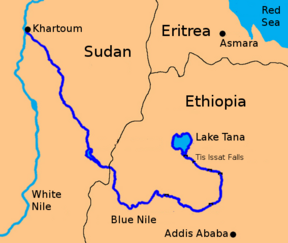 The Blue Nile flows generally south from Lake Tana and then west across Ethiopia and northwest into Sudan. Within 18.6 miles (30 km) of its source at Lake Tana, the river enters a canyon about 400 kilometers (250 miles) long. This gorge is a tremendous obstacle for travel and communication between the northern and southern halves of Ethiopia. The power of the Blue Nile may best be appreciated at Tis Issat Falls, which are 148 feet (45 m) high. Despite the hazards and obstacles of the river, on January 29, 2005, Canadian Les Jickling and New Zealander Mark Tanner reached the Mediterranean Sea after an epic 148 day journey, becoming the first to have paddled the Blue Nile from source to sea. The flow of the Blue Nile reaches maximum volume in the rainy season (from June to September), when it supplies about two-thirds of the water of the Nile proper. The Blue Nile, along with the Atbara River to the north, which also flows out of the Ethiopian highlands, were responsible for the annual Nile floods that contributed to the fertility of the Nile Valley and the consequent rise of ancient Egyptian civilization and Egyptian mythology. With the completion, in 1970, of the Aswan High Dam in Egypt, the Nile floods ended. Despite being the source of most of the Nile's water, Ethiopia has had limited rights to it. Egypt and Sudan, through the Agreement of 1959, split use of these resources. In 1999, the Nile Basin Initiative was created to foster cooperation between all ten countries in the Nile basin. The Blue Nile is vital to the livelihood of Egypt. Though shorter than the White Nile, 56 percent of the water that reaches Egypt originates from the Blue Nile branch of the great river; when combined with the Atbara River, which also has its source in the Ethiopian highlands, the figure rises to 90 percent of the water and 96 percent of transported sediment. The river is also an important resource for Sudan, where the Roseires and Sennar dams produce 80 percent of the country's power. These dams also help irrigate the Gezira Plain, which is most famous for its high quality cotton. The region also produces wheat and animal feed crops. The Tis Issat or Blue Nile Falls consist of four streams that originally varied from a trickle in the dry season to over 400 meters (1313 feet) wide in the rainy season. Regulation of Lake Tana now reduces the variation somewhat, and since 2003, a hydro-electric station has taken much of the flow out of the falls except during the rainy season. The Falls were once considered one of Ethiopia's best-known tourist attractions, but in recent years almost no water comes over the falls due to the new hydropower plant. Ethiopia has one of the lowest levels of energy consumption per capita in the world; only about 22 percent of the population has access to electricity. Electric supply is under the Ethiopian Electric Power Corporation (EEPCo). The state-owned company currently provides electricity to over one million customers in 1,752 towns and communities in Ethiopia, which is only a small proportion of the country's over 70 million inhabitants. Ethiopia is building five hydropower dams to be completed by 2011, with the aim of increasing capacity to 9,000 megawatts by 2018, with surplus power exported to neighboring Kenya, Djibouti, and Sudan. 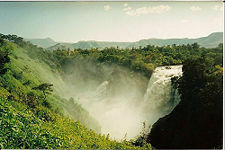 It is generally believed that the first European to have seen the Blue Nile in Ethiopia was Pedro Paez, a Spanish Jesuit who traveled to the area in the early 1600s; however, John Bermudez provided the first description of the Tis Issat Falls in his memoirs (published in 1565), and a number of Europeans who lived in Ethiopia in the late fifteenth century could have seen the river before Paez. Numerous European explorers have contemplated tracing the course of the Blue Nile from its confluence with the White Nile to Lake Tana, but its treacherous gorge, which begins a few miles inside the Ethiopian border, has discouraged all attempts since Frédéric Cailliaud's attempt in 1821. The first serious attempt by a non-local to explore this reach of the river was undertaken by the American W.W. Macmillan in 1902, assisted by the Norwegian explorer B.H. Jenssen. Jenssen planned to proceed upriver from Khartoum while Macmillan sailed downstream from Lake Tana. However, Jenssen's boats were blocked by the rapids at Famaka short of the Sudan-Ethiopian border, and Macmillan's boats were wrecked shortly after they had been launched. Macmillan encouraged Jenssen to try to sail upstream from Khartoum again in 1905, but he was forced to stop 300 miles short of Lake Tana. The British consul R.E. Cheesman managed to map the upper course of the Blue Nile between 1925 and 1933, but instead of following the course of the river and its impassible canyon, he mapped it from the highlands above, traveling some 5,000 miles by mule. On April 28, 2004, geologist Pasquale Scaturro and his partner, kayaker and documentary filmmaker Gordon Brown, became the first people to navigate the Blue Nile. Though their expedition included a number of others, Brown and Scaturro were the only ones to remain on the expedition for the entire journey. They chronicled their adventure with an IMAX camera and two handheld video cams, sharing their story in the IMAX film, Mystery of the Nile and in a book of the same title. Nevertheless, the team was forced to use outboard motors for most of their journey, and it was not until January 29, 2005, when Canadian Les Jickling and New Zealander Mark Tanner reached the Mediterranean Sea, that the river had been paddled for the first time under human power. 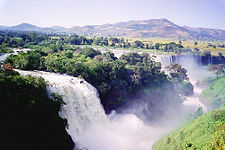 The Blue Nile Falls (or Tis Issat or Tissisat Falls) fed by Lake Tana near the city of Bahar Dar, Ethiopia, form the upstream of the Blue Nile. ↑ Philips and Carillet, (2006), 118. ↑ Ethiopian Electric Power Corporation, Power Systems Interconnection. Retrieved September 11, 2008. ↑ Bangs and Scaturro (2005). Bangs, Richard, and Pasquale Scaturro. 2005. Mystery of the Nile: The Epic Story of the First Descent of the World's Deadliest River. New York City: G.P. Putnam's Sons. ISBN 9780399152627. Chadwick, Alex. Rafting Down the Blue Nile: Explorers Document First-Ever Journey Down Entire River. NPR. Retrieved September 11, 2008. Ethiopian Electric Power Corporation. Power Systems Interconnection. Retrieved September 11, 2008.
International Food Policy Research Institute. May 2007. Integrated Management of the Blue Nile Basin in Ethiopia. Retrieved September 11, 2008. Moorehead, Alan. 1972. The Blue Nile. New York: Harper & Row. Penn, James R. 2001. Rivers of the World: A Social, Geographical, and Environmental Sourcebook. Santa Barbara, Calif: ABC-CLIO. ISBN 9781576070420. Phillips, Matt, and Jean-Bernard Carillet. 2006. Ethiopia and Eritrea. Footscray, Vic: Lonely Planet. ISBN 9781741044362. Ullendorff, Edward. 1968. Ethiopia and the Bible. London: Oxford U.P. ISBN 9780197260760. This page was last modified on 13 June 2016, at 18:51.